PennsylvAsia: Japanese animated film In This Corner of the World (この世界の片隅に) back in Pittsburgh, August 5. 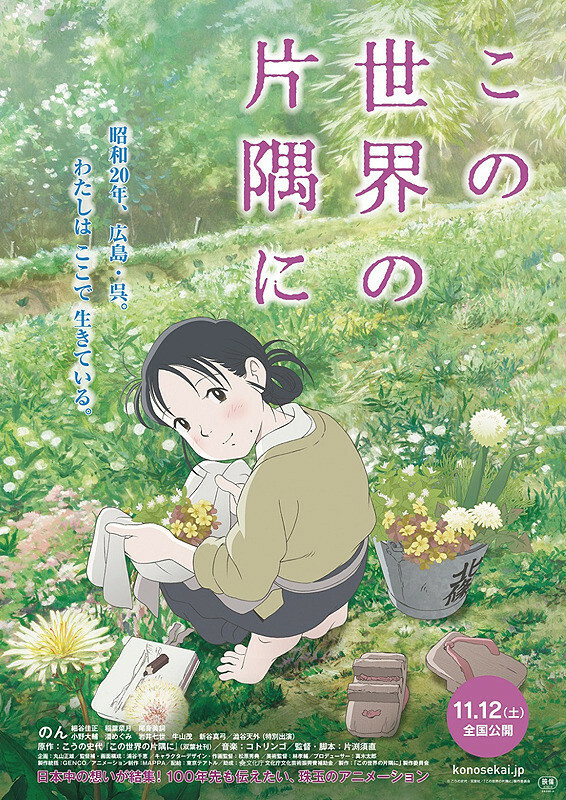 Japanese animated film In This Corner of the World (この世界の片隅に) back in Pittsburgh, August 5. The City of Asylum will host a screening of the 2016 animated Japanese film In This Corner of the World (この世界の片隅に) on August 5, in collaboration with Remembering Hiroshima, Imagining Peace to commemorate the 1945 atomic bombings of Japan. The award-winning story of IN THIS CORNER OF THE WORLD follows a young lady named Suzu Urano, who in 1944 moves to the small town of Kure in Hiroshima to live with her husband’s family. Suzu’s life is thrown into chaos when her town is bombed during World War II. Her perseverance and courage underpin this heart-warming and inspirational tale of the everyday challenges faced by the Japanese in the midst of a violent, war-torn country. This beautiful yet poignant tale shows that even in the face of adversity and loss, people can come together and rebuild their lives. But despite its setting in Hiroshima and the nearby port city, Kure, the new anime film “In This Corner of the World” is as soft as its brown-and-green palette, as romantic as its perpetually blushing protagonist, Suzu, a young wife coming of age during World War II. As war rages, Suzu’s endurance becomes the personification of hope for postwar Japan. The movie plays from 5:00 to 8:00 pm and is free and open to the public, though online RSVP is required.